The Alaskan Malamute is an extremely strong, independent, and determined dog, yet very fun loving. Its favorite pastime is pulling a sled or cart, but it also enjoys running around and roaming the outdoors. The Alaskan Malamute is very family oriented and friendly, and well-behaved inside, as long as it is able to exercise every day. If it does not get its adequate amount of exercise, the Alaskan Malamute can become very aggravated and bored, which then leads to destruction. This breed loves people and is extremely sociable and welcoming. However, when it comes to bizarre dogs, pets, or livestock, it may get aggressive. It has the tendency to sometimes have a dominant attitude and tends to enjoy digging and howling. The Alaskan Malamute feels at home in the cold weather and particularly loves to haul a sled in the snow. This breed loves exercise and can run for miles and miles. It needs a lot of exercise with long walks or the chance to run around outside in order to release its energy. When it comes to cold weather, the Alaskan Malamute can easily live outdoors in cold climates. However, with warmer weather, it would much prefer to be inside. Its coat needs brushing about once or twice a week, and even more when it is in its shedding phase. The Alaskan Malamute has a life span of ten to twelve years. The major health concerns associated with this breed are CHD and cataracts. Some of the minor health concerns are chondrodysplasia and hypothyroidism. Gastric torsion, hemeralopia, polyneuropathy, and seizures are occasionally seen in this breed. In order to keep its health under control, some suggested tests to have on the Alaskan Malamute are hip, eye, thyroid, and chondrodysplasia clear rating tests. The Alaskan Malamute came from the spitz family, developing in the Arctic regions, which explains its love for cold climate conditions. Its specific origins are a mystery, but it is said to have been living among the Mahlemuts, native Inuit people who lived along Norton Sound in Alaska. The dogs were used as hunting partners for big animals like seals and polar bears and towed the heavy bodies back home. 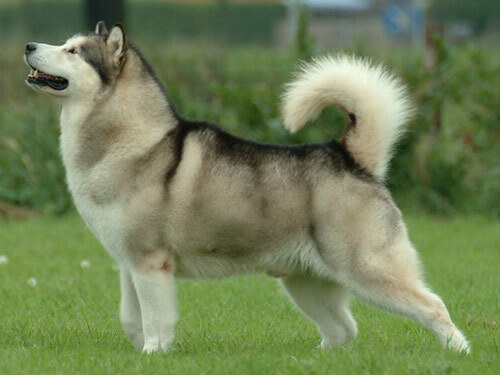 The Alaskan Malamute was more used for its large size and strong body as opposed to being fast. This allowed one dog to be able to do the work of many smaller dogs combined. These dogs were essential to the peoples’ way of life and were treated as part of the family, yet were never spoiled as pets. When explorers first came to the region in the 1700s, they were amazed by the strong dog and their owners love for them. A plethora of outsiders came to Alaska in 1896 when gold was discovered there. The dogs were used for entertainment by having weight pulling contests and races. The native breeds were interbred with each other and with the dogs brought by settlers to create a faster race dog or just to increase the number of dogs needs for the gold rush. The pure Alaskan Malamute started to become in danger of being lost. However, in the 1920s, a New England dog racing fanatic found some good specimens and started breeding traditional Malamutes again. Their reputation grew and the Alaskan Malamutes were used for a trek to the South Pole as well as service dogs in World War II. The breed finally received AKC recognition in 1935 and has been gradually growing in popularity as a great show dog and loyal companion as a pet.